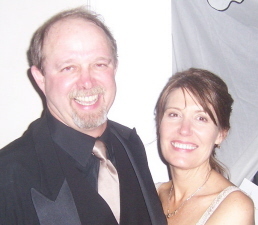 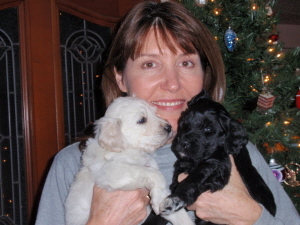 I am Carol Buddle McDonald...My family (husband Joseph, daughters Stefanie & Seanna, son-in-law Buck, granddaughters Maven, Fia & Hazel) and I have enjoyed every minute of bringing the most amazing puppies into the world. 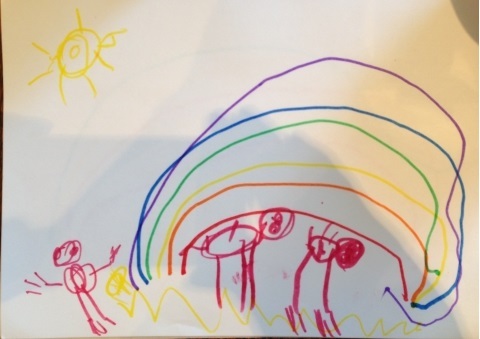 I would like to share some family pictures with you. 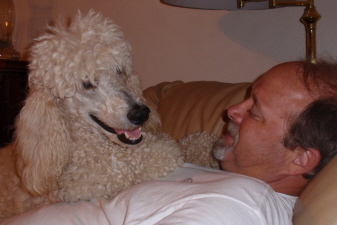 Though I have a kazillion pictures, I hope you will get a sense of how much we love our dogs and the part they play in our lives with the few I have selected from over the years. 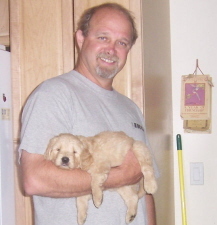 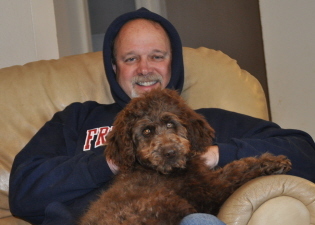 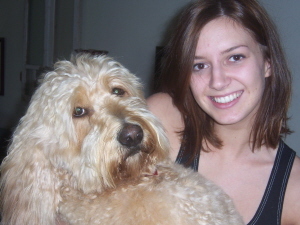 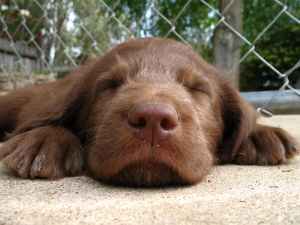 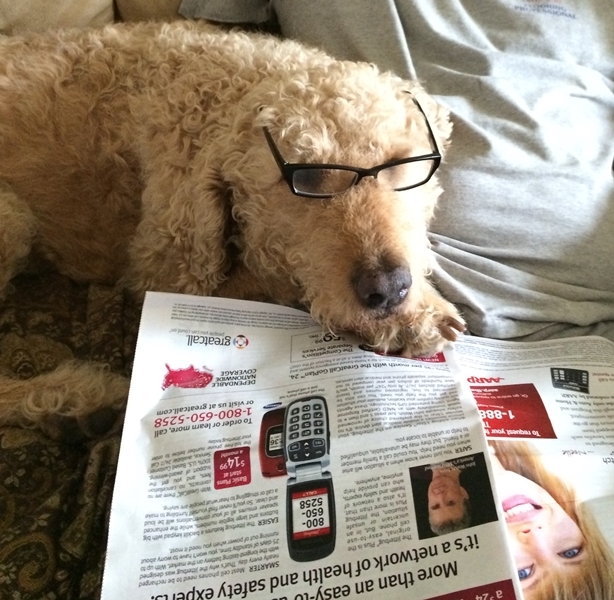 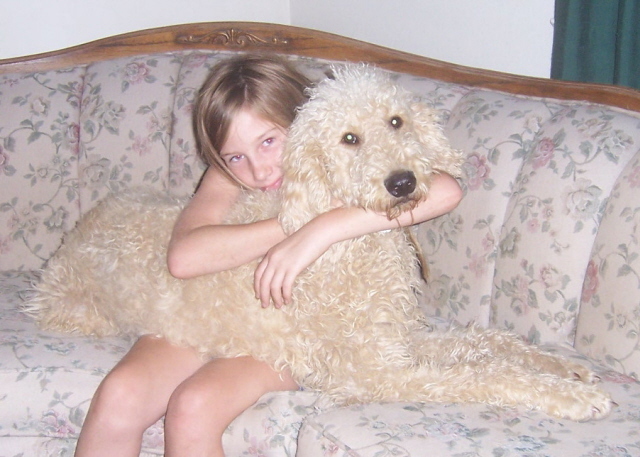 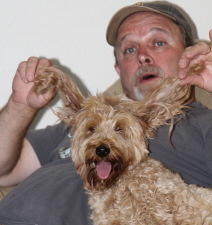 Harley gave us our first Labradoodle litter here at Rainbows End Puppies in February of 2005. 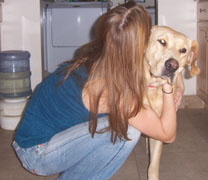 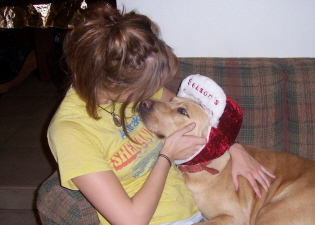 She was my constant companion & best friend. 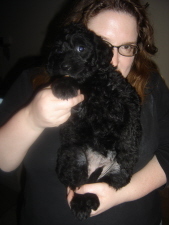 This is our daughter, Seanna. 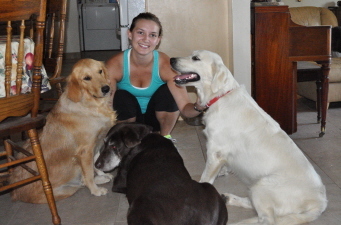 She just finished taking Quade for a run and was greeted by Shiva, Harley & Simba. 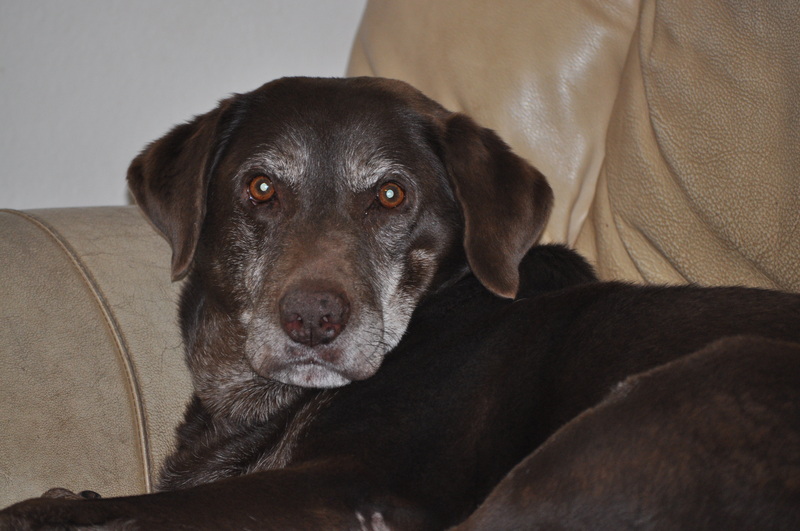 Harley, the chocolate Labrador retired years ago. 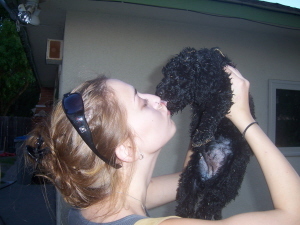 She is the grandmother of Missy. 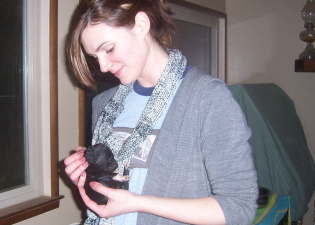 Seanna with a Shiva-Neo Puppy. 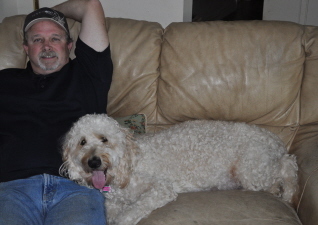 Joseph with Addie hours before she delivered her first litter. 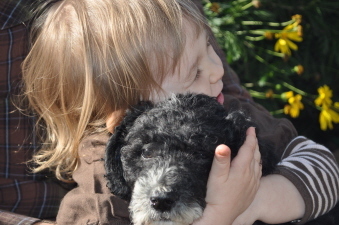 Seanna with one of Patty & Casper's Double Doodle puppies. 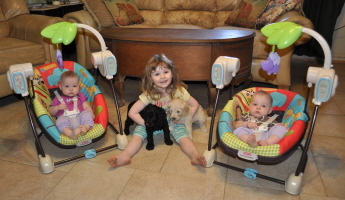 Our Granddaughters Fia, Maven & Hazel with Addie/Socks puppies. 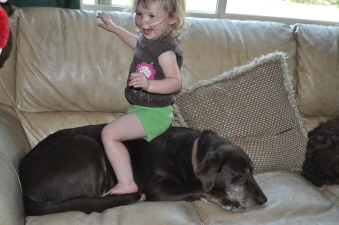 Maven excited about sitting on Harley...don't worry, she was quickly removed. 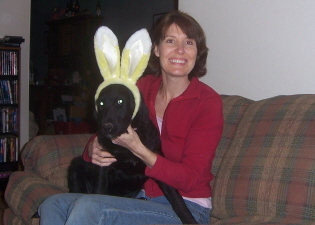 Harley was a good sport as always. 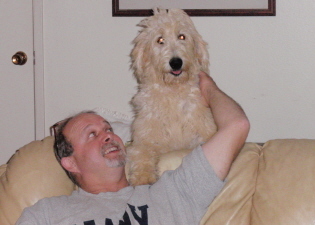 Bailey is the unofficial Ruler of Our Doodle Kingdom. 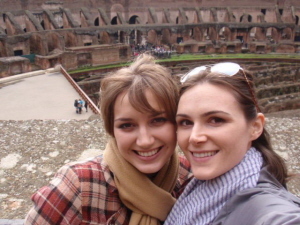 Our daughters Seanna & Stefanie in Rome! 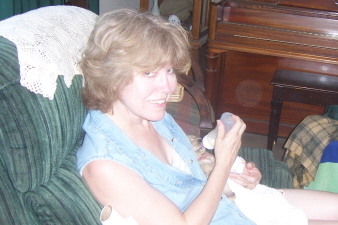 Stefanie is the mother of our granddaughters; Maven, Hazel & Fia. 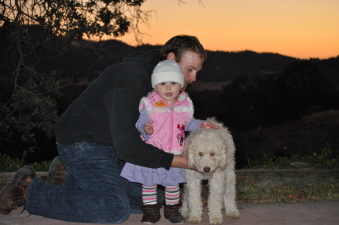 Buck (our son-in-law), Maven & Wrigley. 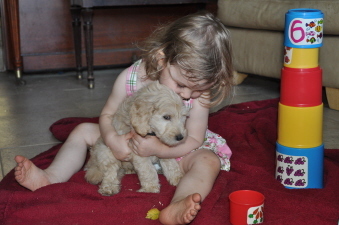 Seanna with a Sorsha-Casper Labradoodle Puppy. 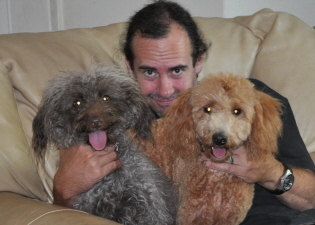 Me with two Gabby-Socks puppies. 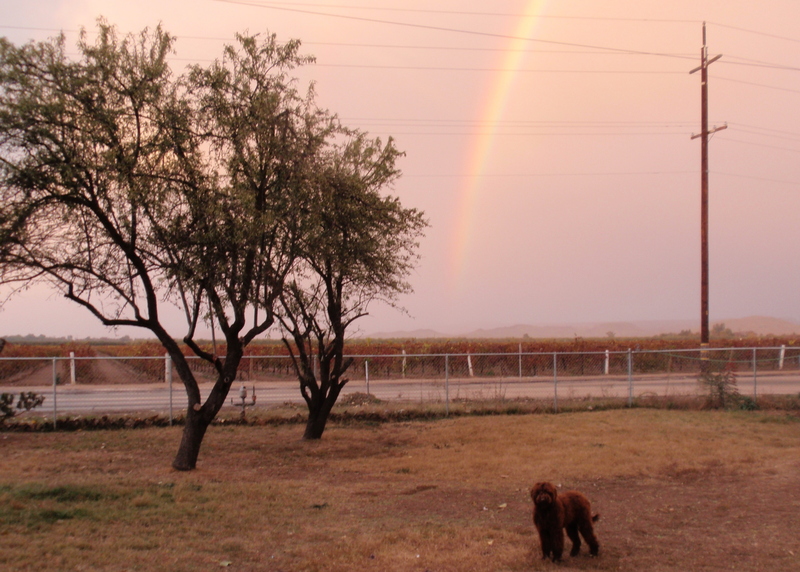 Sunny & a Rainbow in our front yard. 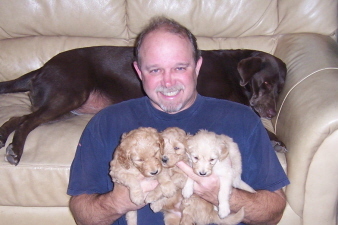 Joe with Doodle babies. 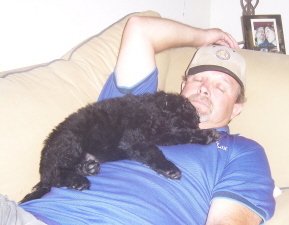 Harley napping behind them. 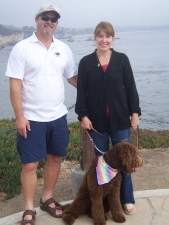 Joe and I with Sorsha at Shell Beach. 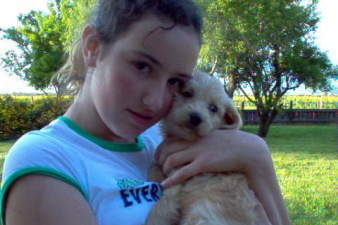 Mickie & Labradoodle puppy, Nemo. 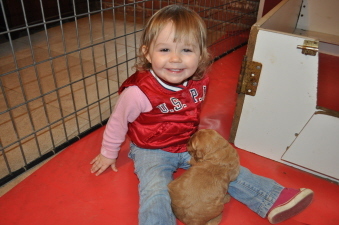 Seanna with Harley's Labradoodle puppies. 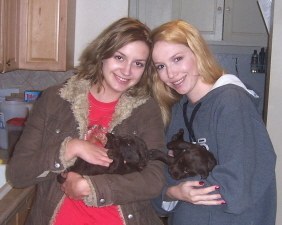 Seanna & Megan with Harley's puppies. 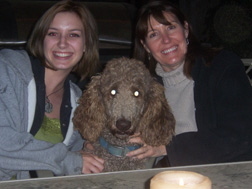 Seanna & I with Ramsey. 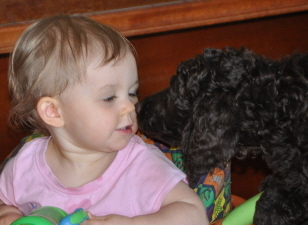 Dundee at eight months old with our sweet neighbor Sabrina. 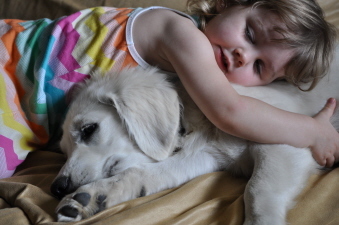 Seanna taking a nap with Cindy, Harley & Bailey. 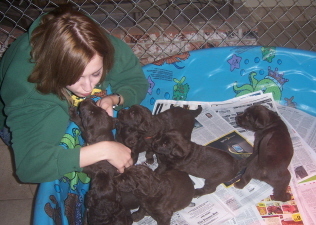 My sister, Sherri, bottle feeding a puppy from a very large litter. 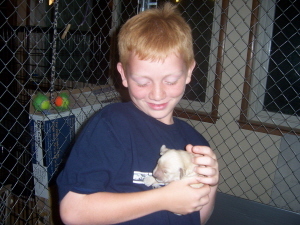 Our nephew, Sean helping out in the puppy loving department. 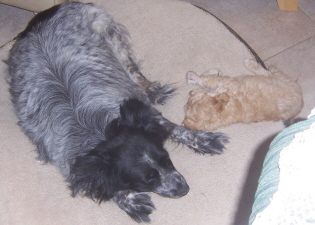 Bailey keeping a watchful eye over Big Momma's puppies. 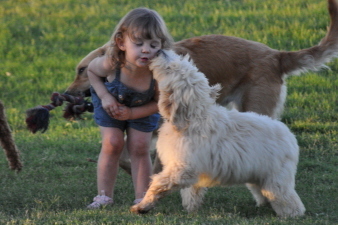 Princess Buttercup loves water of any kind. 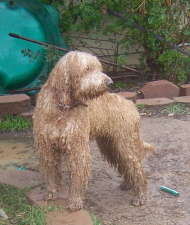 She always had a blast when it rained! 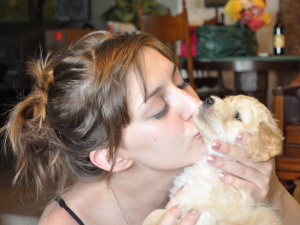 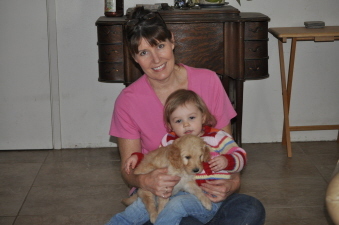 My niece Cyndi with Paige a Harley puppy and the mother of Missy. 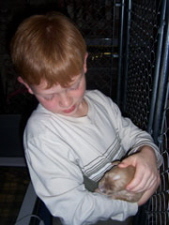 Sean with a Buttercup baby. 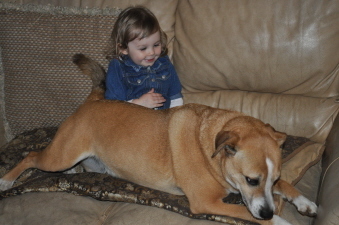 Seanna with Pinto & Cindy. 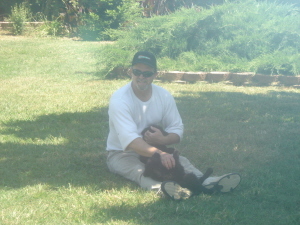 Joe hangin' out on the lawn with a few puppies. 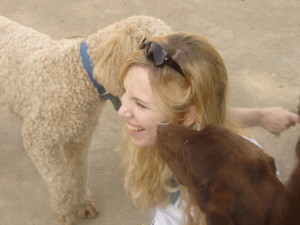 Megan with Pinto and Harley. 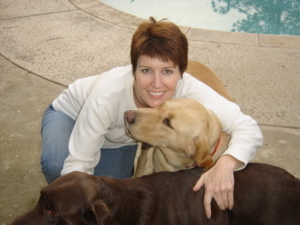 Me with Cindy and Big Momma. 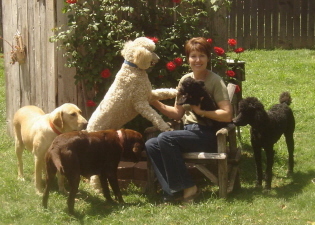 Here I am with the dogs that started Rainbows End Puppies. 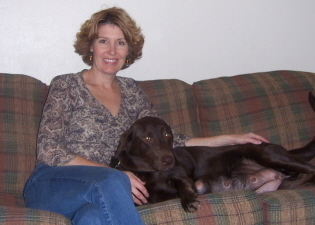 Clockwise starting with Chocolate Labrador Cindy, Yellow Labrador Big Momma, Poodle Stud Muffin Pinto, Labradoodle Jasmine in my lap and Poodle Kadie. 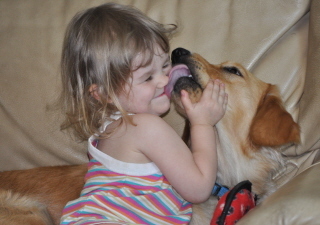 Not Pictured is Chocolate Labrador Harley.